There is no loss as painful as seeing your loved ones slowly succumb to dementia. It’s like seeing a once healthy and blooming flower slowly wither away. When the disease is progressing, you’ll experience changes in the way your loved ones are interacting with you. They may oftentimes be forgetful and in the serious spectrum, their life is characterized by severe impairment and difficulty in remembering relationships with the people around. Understand the realities of the disease. You must refrain from being in constant denial with respect to the current condition of your loved one. Understand what the disease is about and face the realities that are associated with it. For instance, it would be a good start to let it sink in your mind that dementia will gradually worsen over time and the communication and relationship with your loved ones will also deteriorate. This way, you can find ways on how you can halt such issues and look for other possible options. Talk to them by their names. You need to communicate with your loved ones based on the name they want to be called. 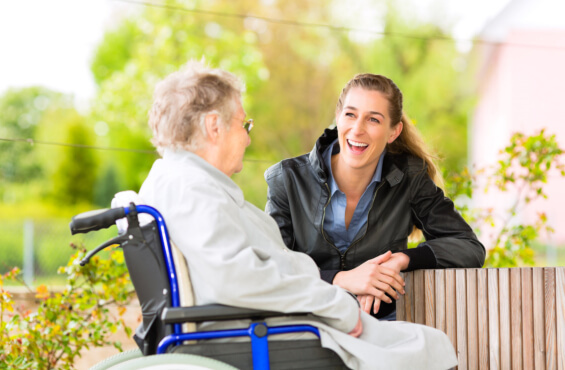 This will help you establish a more humane interaction as you render Senior Care Services. By doing this, you can engage them in a conversation. It is important that you’ll talk in a warm and calm voice and don’t ever feel tempted to condensate the way you talk just because your loved one is experiencing cognitive regression. Make sure to talk about important matters one at a time, so they will not have difficulty in processing the information that you’re feeding them. Don’t be the one who’ll just talk and talk. Make sure that the communication line is two-way in such a manner that you’ll actively listen to what your loved ones are saying to you. Whenever there are certain things that you don’t understand, all you have to do is to politely tell them to repeat what they were saying and listen intently so you can get the gist of what they want to relay to you. Through these communication techniques practiced in most Senior Home Care Services in Georgia, you will be able to meaningfully connect with your loved ones and understand them even better. You’re ensuring them that they are always cared for by constantly talking and reaching out to them. By communicating with them, you are strengthening your relationships even amidst the challenges posed by the disease. This entry was posted in Elder Care, Home Care and tagged Dementia, Elder Care, Health Care, Senior Care Services, Senior Home Care. Bookmark the permalink.